It's easy to feel cynical about brands trying to be clever on social media, since most of their attempts at seeming witty or cool with the kids usually feels like they're trying way too hard. And then occasionally, there comes a rare moment on Twitter or Instagram when a brand pulls off something genuinely funny and you can't help but feel the need to tip your hat in appreciation. 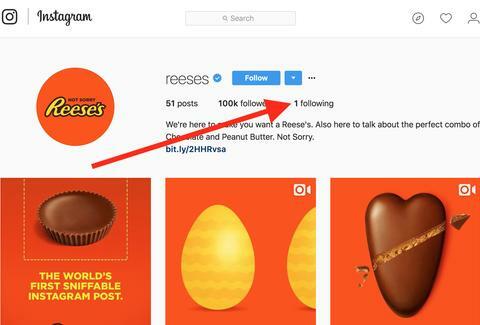 While we typically expect that sort of pleasant social media surprise from the accounts of fast food chains, Reese's just revealed itself to be a contender in the candy category when fans discovered the peanut butter cup purveyor's Instagram account features one tiny, hilarious detail hidden in plain sight. The curious detail was recently pointed out by Twitter user @julp, who noticed that the official Reese's account only follows a single other account: Reese Witherspoon's. The fact that Reese’s/Reese connection exists has been pointed out by others in the past, but @julp’s eagle-eyed observation caught the eye of whoever runs the Reese’s account, because they responded. Although Witherspoon has previously broadcast her appreciation for Reese's Pieces online, it appears the superstar actress doesn't follow the brand's account back... yet. Of course, this isn't the first time a brand got playful with the people they follow on Twitter or Instagram (looking at you, KFC), but it's still a nice and refreshing reminder that brands can indeed pull off a cool social media move every once and a while. Hats off to the person running the Reese's Instagram. A raise is in order.